Honorific name: Fumonentsu Zenji. 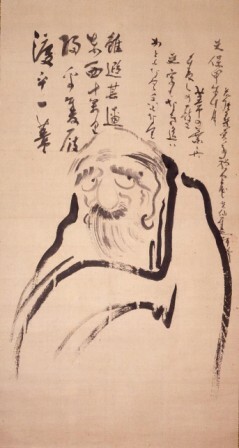 Pen name: Hyakudo, Kyohaku, Tenmin, Muho-sai, Taiho, Ayo. Dharma transmission from Gessen Zen'ne. After spending time preaching around the countryside, he became the abbot of Shofuku-ji at the age of 39. 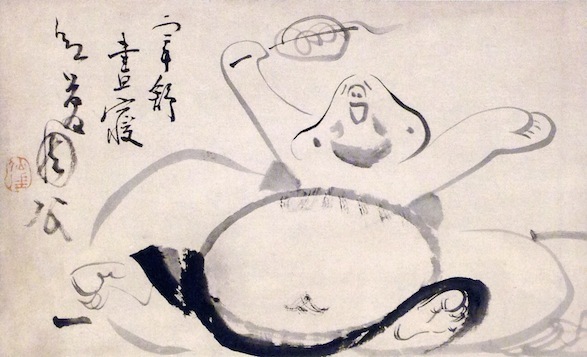 His works conveyed Zen teachings with light-hearted wit and often self-mocking humor. They were easy to interpret and were widely accepted and loved by the people. He now has an international reputation. Das Kreis-Dreieck-Viereck ist Sengai's geistige Vorstellung des Uni. versums. Der Kreis stellt das Unendliche dar, und das Unendliche ist die Basis alles Seienden. Das Unendliche jedoch ist in sich selbst formlos. Wir Menschen, die mit den Sinnen und dem Intellekt ausgestattet sind, verlangen nach greifbaren Formen. Daher das Dreieck. Das Dreieck ist der Beginn aller Formen. Aus ihm kommt zuerst das Viereck. Ein Viereck ist ein verdoppeltes Dreieck. Dieser Verdopplungsprozess setzt sich unendlich fort, und so gelangen wir zur Vielheit der Dinge, welche die chinesischen Philosophen "die zehntausend Dinge"-das ist das Universum-nennen. Die Schwierigkeit mit uns sprachlich eingestellten Lebewesen ist, dass wir die Sprache realistisch nehmen und vergessen, dass sie ohne Zeit von keinerlei Bedeutung ist. In Wirklichkeit ist Sprache Zeit, und Zeit ist Sprache. So kommen wir dazu zu dereken, dass am Anfang der Welt ein Etwas ist, das real und konkret ist-so etwas, wie ein Welt von Galaxien, wenn auch formlos und nebelhaft, jedoch wirklich und greifbar. Dies ist der Ursprung des Universums, von welchem schliesslich unendliche Arten von Dingen sich forrnen und variieren. Daher kommt, dass man beginnt, Zeit selbst als etwas Konkretes und Reales zu denken. Ein Kreis wird zum Dreieck, dann zum Viereck und schliesslich zu unendlich verschiedenartigen, wechselnden, variierenden Formen. Auf diese Weise hat sich die biblische Erzählung von der Schöpfung in der Vorstellung Vieler in historische Wahrheit verwandelt. Zen ist sehr gegen solche "Erdichtungen". 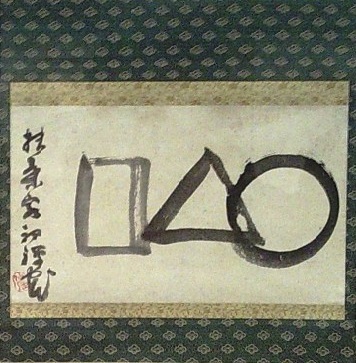 "The circle-triangle-square is Sengai's picture of the universe. 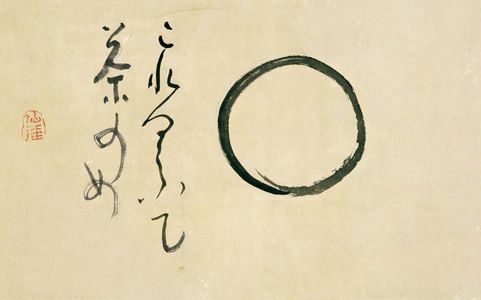 The circle represents the infinite, and the infinite is at the basis of all beings. But the infinite in itself is formless. We humans endowed with senses and intellect demand tangible forms. Hence a triangle. The triangle is the beginning of all forms. Out of it first comes the square. A square is the triangle doubled. This doubling process goes on infinitely and we have the multitudinosity of things, which the Chinese philosopher calls 'the ten thousand things', that is, the universe. The trouble with us linguistically-minded beings is that we take language realistically and forget that language is of no significance whatsoever without time. In truth, language is time and time is language. We thus come to think that there is in the beginning of the world a something which is real and concrete, such as a world of galaxies which though formless and nebulous is yet real and tangible. This is the foundation of the universe on which we now have all kinds of things, infinitely formed and varied. It is thus that time itself begins to be thought of as something concrete and real. A circle turns into a triangle, and then into a square, and finally into infinitely varied and varying figures. In the same way the Biblical account of creation has turned into historical truth in the minds of many. But Zen is very much against such fabrications. There is another and a more traditional interpretation that may be given to these three figures of forms. 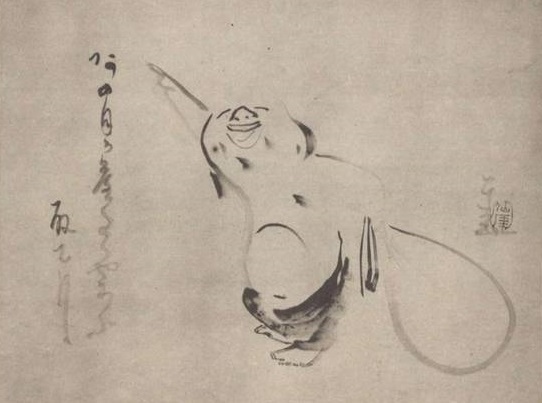 Sengai was familiar with Shingon, the mantra sect of Buddhism, as well as Zen. He liked Shingon because it taught the identity of the bodily existence (rupakaya) with ultimate reality (dharmakaya). The bodily existence is here represented by a triangle which symbolizes the human body in its triple aspect, physical, oral (or intellection), and mental (or spiritual). The quadrangle represents the objective world which is composed of the four great elements (mahabhuta), earth, water, fire and air. The Dharmakaya, the ultimate reality, is the circle here, that is, the formless form. We generally hold a dichotomous view of existence, form (rupakaya) and formless (arupa), object and subject, matter and spirit, and think they contradict each other and are mutually exclusive. Both Shingon and Zen, however, oppose this view and hold that what is form is formless or empty (sunya), that is, they are identical. Text: Painting of the 6th patriarch E'no grinding with a mortar. Grinding, kneading, sifting or stamping. After he worked hard, he got full and went to sleep snoring loudly. Painted by Sengai, the first Zen temple in Japan, respectfully in the early spring in 1809. Temple: The Myoshin-ji branch. The 123rd abbot of Shofuku-ji in Hakata. Style: Vertical silk mounting. Normal style. 『を月様幾ツ十三七ツ』 How old are you, dear Moon? Thirteen, seven? Baizhang revisited Mazu for a consultation. Mazu raised his fly whisk. The master [i.e., Baizhang] asked, “Is this its function or beyond its function?” Mazu hung his whisk back in its old spot. The master [remained speechless] for a while. Mazu said, “Later when you open your lips how will you instruct others?” The master thereupon snatched the whisk and raised it. Mazu said, “Is this its function or beyond its function?” The master also hung the whisk back up. Mazu immediately gave out a shout. The master thus became deaf for three days and he thereupon had a great awakening. One day Baizhang accompanied Mazu on a walk. A flock of wild ducks flew past them. Mazu said, "Where'd they go ?" Baizhang said, "They flew away." Mazu then twisted Baizhang's nose so hard that he cried out. Mazu said, "So you say they've flown away!" Upon hearing these words Baizhang attained enlightenment. In dealing with his disciples, Te-shan resorted to the rod as frequently as Lin-chi resorted to the shout, as evidenced by the current saying, “Te-shan's rod, Lint-chi's shout.” Once Te-shan announced to his assembly, “If you speak rightly, I will give you thirty blows. If you speak wrongly, I will also give you thirty blows.” When Lin-chi heard about this utterance, he said to his friend Lo-p'u, “Go to ask him why the one who speaks rightly should be given thirty blows. As soon as he begins to strike, catch hold of his rod and push it against him. See what he will do.” Lo-p'u acted accordingly. As soon as he put the question, Te-shan started to strike him, and he caught hold of the rod and made a violent thrust against him. Thereupon, Te-shan returned quietly to his room. When Lo-p'u came back to report to Lin-chi, the latter said, “From the very beginning I have had my doubts about that fellow. Be that as it may, do you recognize the true Te-shan?” As Lo-p'u fumbled for an answer, Lin-chi gave him a beating. The rain falls upon the just and upon the unjust. 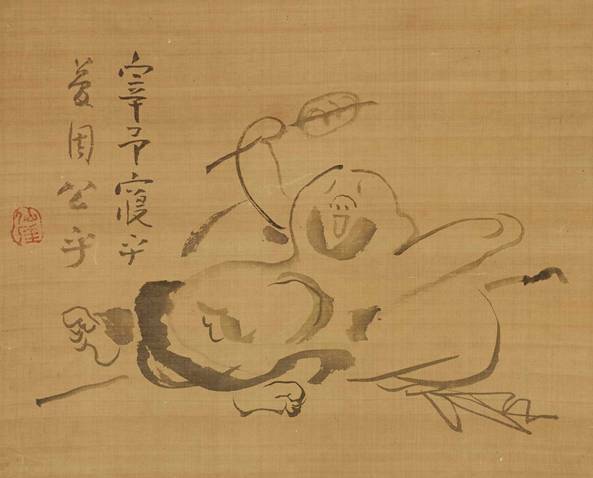 Rinzai means that in other temples people are dead while they are alive, and when they die their bodies are burned. In this temple, under Obakn, we are really alive, and we die daily, and are buried daily, and are resurrected daily. T o bury a dead man is a waste of time. It is the really living who must gain their life by losing it. When Linji was planting pine trees, Huangbo asked, “What's the good of planting so many trees in the deep mountains?” “First, I want to make a natural setting for the main gate. Second, I want to make a landmark for later generations,” said Linji, thumping the ground with his mattock three times. “Be that as it may, you've already tasted thirty blows of my stick,” replied Huangbo. Again Linji thumped the ground with his mattock three times and breathed out a great breath. “Under you my line will fl ourish throughout the world,” said Huangbo. The monks were silent. 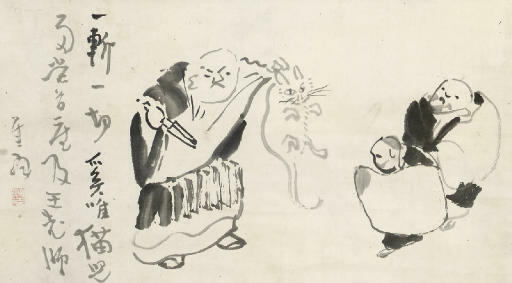 The master then made the gesture of cutting the cat, and walked away. Need fuel for the hearth. Call this roasting the Buddha?! Having one's beard fall off was a kind of spirtual retribution. Tianran replied, 'I'm collecting sarira from the Buddha image's ashes'. 'How stupid to think you can get sarira from a statue!, retorted the monk. 'Then please hand me another, it's a cold night', replied Tanxia. 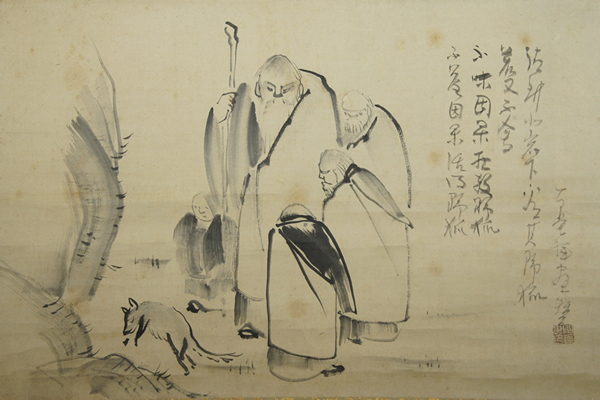 One day a hunter, who disliked monks, passed by Master Ma's hermitage as he was chasing a herd of deer. The master greeted him. The hunter asked, “Has the Venerable seen a herd of deer passing by? The master said, “Ah, this person. All his ignorance and defilements accumulated over vast ages have today suddenly come to an end.” At that point the hunter set down his bow and arrows and cut off his hair with a knife. He was ordained as the monk Huizang with Master Ma, and went to work in the monastery kitchen. Eventually he became a teacher at Mt. Shigong. Qingping [Lingzen] asked Cuiwei [Wuxue], “What is the exact meaning of the Patriarch's coming from the West” Cuiwei replied, “I will tell you when no one is around.” After quite a while Qingping said, “There is no one right now. Please tell me, Teacher.” Cuiwei got down from the Chan platform and led Qingping into a bamboo garden. Qingping said again, “There is no one right here. Please tell me, Master.” Cuiwei pointed to the bamboo and said, “This bamboo grows so tall. 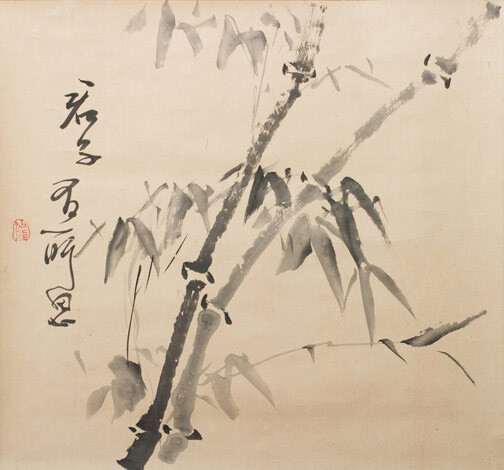 That bamboo grows so short.” Qingping suddenly realized its profound principle. One strike made him forget his learning. What kind of sound was it? Zen monk Kyogen (Hsiang-yen) of China was a disciple of Isan (Wei-shan, 771-853). He was fond of keeping notes of his masters, and thought a grcat deal of them. One day, he found out that all the notes and knowledge he had accumulated were after all of no use in really understanding Zen. He then burned them, and being so disappointed at his inability to gain satori, he decided not to go on with this pursuit. He retired to a country temple where he devoted himself to looking after an old master's graveyard. One day, while sweeping the ground, it happened that a piece of stone swept away by his broom struck a bamboo nearby. The sound thus produced awakened his mind to a state of enlightenment. He composed a poem in which this "one strike" is referred to. 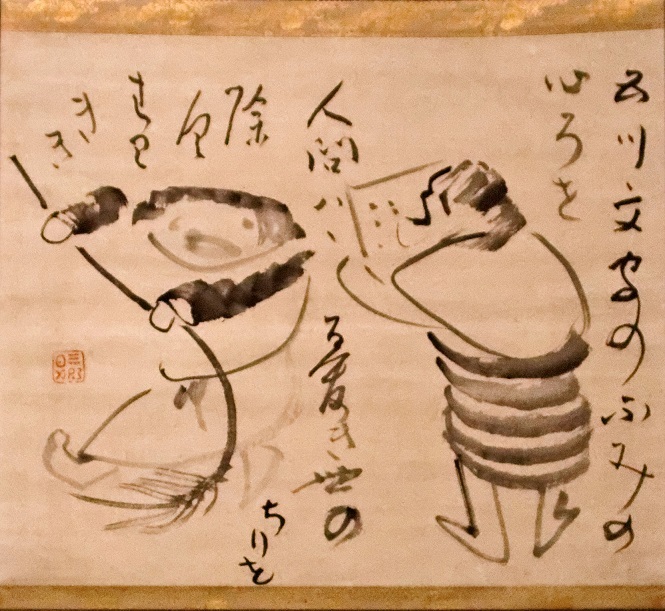 Sengai now asks: "What kind of sound was it that made Kyogen come to a realization?" He answers in the last two lines. 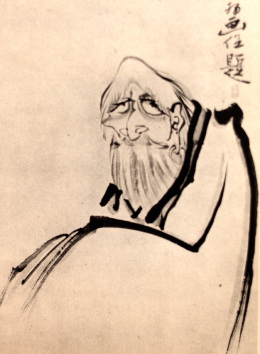 We call our Founder Senkō Yōgō. 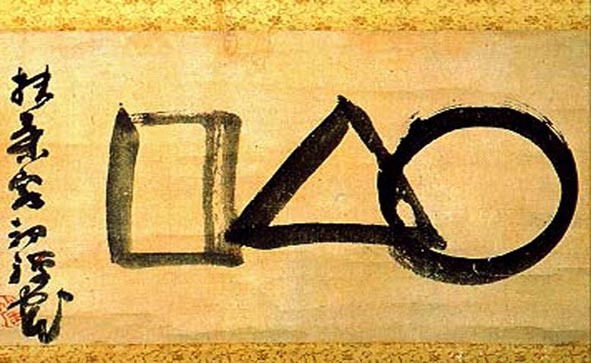 Eisai 栄西　Also Yosai; the founder of the Japanese Zen school (1141-1215). Ordained at 14, he studied and practiced the Tendai teaching. He went to Sung China in 1168 and brought back Tendai scriptures in the same year. In 1187, he traveled to China again, where he received the Rinzai Zen tradition from Hsu-an Huai-ch'ang 虚庵懐敞 (Koan Esho). After returning home in 1191, he built Shofukuji 聖福寺, the first Zen temple in Japan. In the face of bitter attacks from Tendai monks on this newly introduced school, Eisai approached the Kamakura Shogunate, the government of the time. In 1202, the government built Kenninji 建仁寺 in Kyoto, and appointed him the first chief abbot. In order to appease the monks of Mt. Hiei, the temple was made a center of Tendai and esoteric Buddhism as well as Zen. In 1215, he founded Jufukuji 寿福寺 in Kamakura, and died in the same year. He introduced the cultivation of tea into Japan, and wrote a book, entitled On Drinking Tea as A Way of Nourishing Spirit (Kissa-yojo-ki 喫茶養生記). 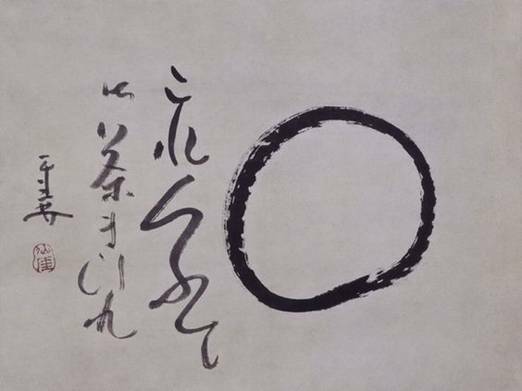 His other works include the Discourse on the Propagation of Zen and Protection of the State (Kozen-gokoku-ron 興禅護国論), which is the first Zen work in Japan. He was given the posthumous title, Senko Kokushi 千光国師 (State Master a Thousand Rays of Light). 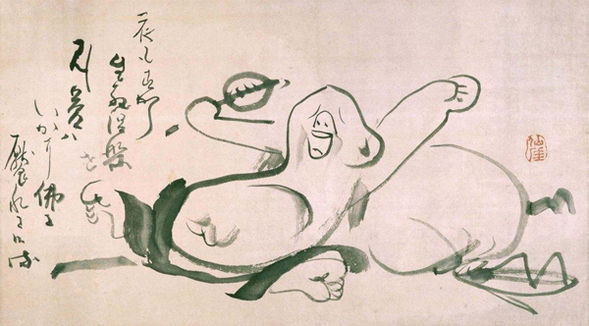 Edo period Zen priest Sengai (1750-1837) is known for disseminating the teachings of Zen through laughter and humor. 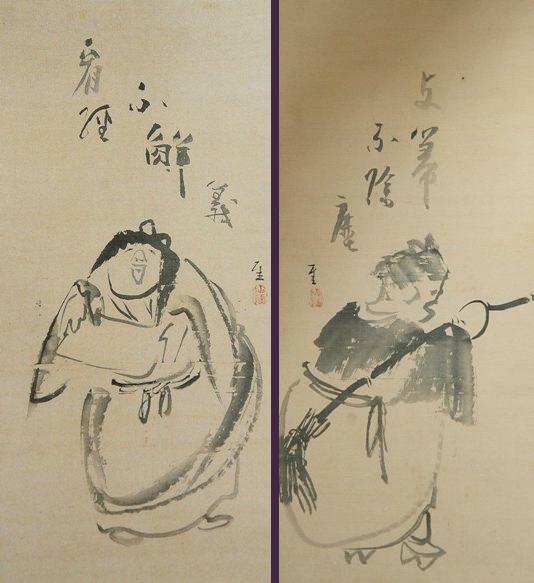 The paintings and calligraphy of Sengai, besides the collection of Shōfuku-ji in Hakata of which he was the head priest and of Kyohaku-in where he spent his retired life, the Idemitsu collection assembled by Idemitsu Sazo the first director of the Museum, the Fukuoka Museum collection and the Kyushu University, School of Letters collection (Former Collection of Dr. Morihiko Nakayama) are considered to be outstanding both in quality and quantity. These extraordinary collections of the eastern and the western Japan will meet for the first time since the exhibition held in 1986 (Shōwa 61) to commemorate Sengai´s 150th year memorial. 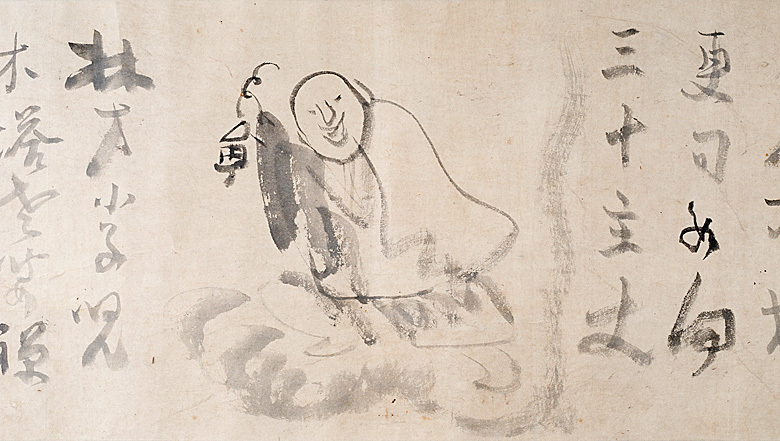 This exhibition will present a chance to explore the world of Zen painting and to feel the spirit of Zen preached by Priest Sengai. Sengai Gibon's parents were farmers, and throughout his life he retained a deep respect for agricultural workers. “Farmers,” he wrote, “are the foundation of civilization.” He became a monk at age eleven, primarily in order to reduce the financial burden on his family. 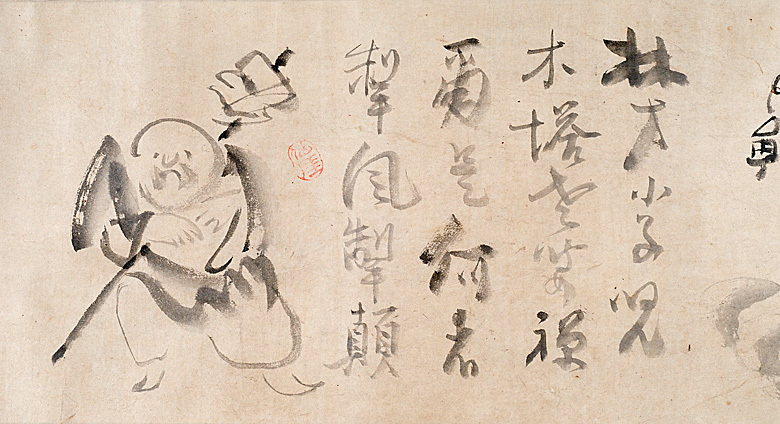 At the temple school he attended, he was introduced not only to Buddhist doctrine and practice, but also to calligraphy, brushwork, and poetic composition. 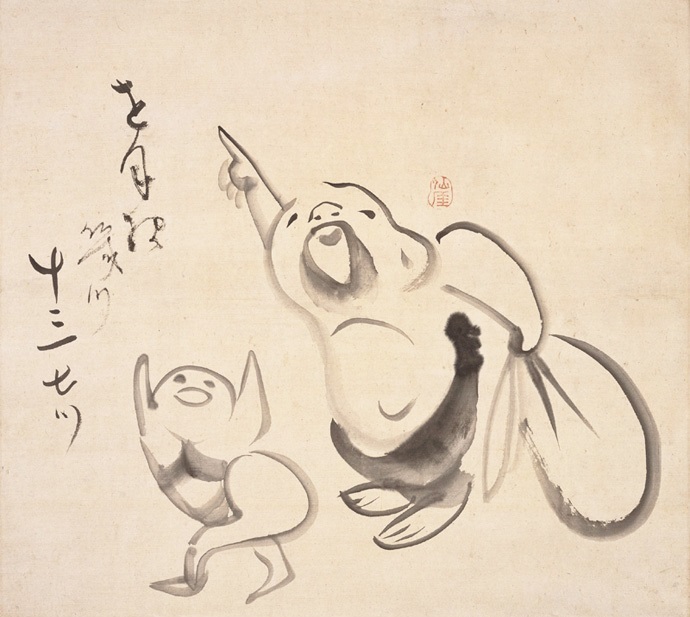 Even as a youngster, Sengai demonstrated a talent for drawing. At the age of nineteen, he decided to look for a teacher who could help him achieve awakening. He traveled about Japan, visiting temple after temple, seeking an appropriate master, finally settling upon Gessen Zenne, under whose direction Gasan Jito and Inzan Ien had come to their first kensho. Watching the occasional cloud go by. I remain alone night and day. In this small hut all alone. 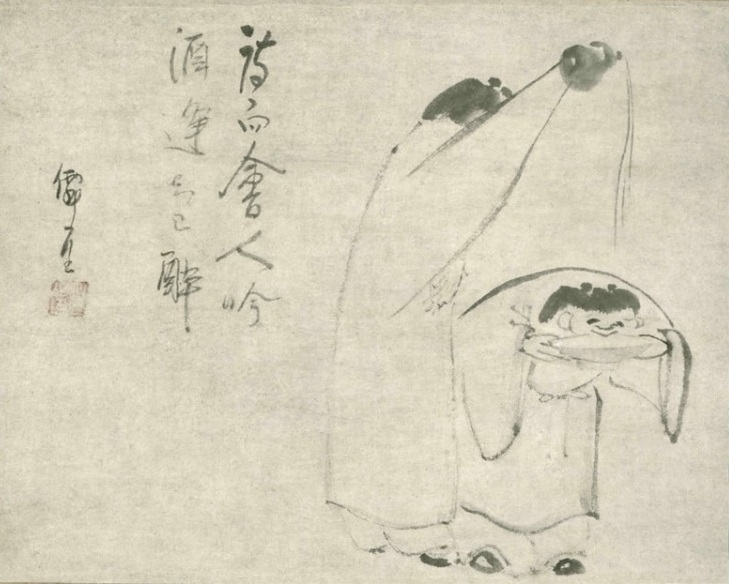 These poems, however, may have described more an idealistic than an actual state, because, as it turned out, in some ways Sengai's career began after his retirement. 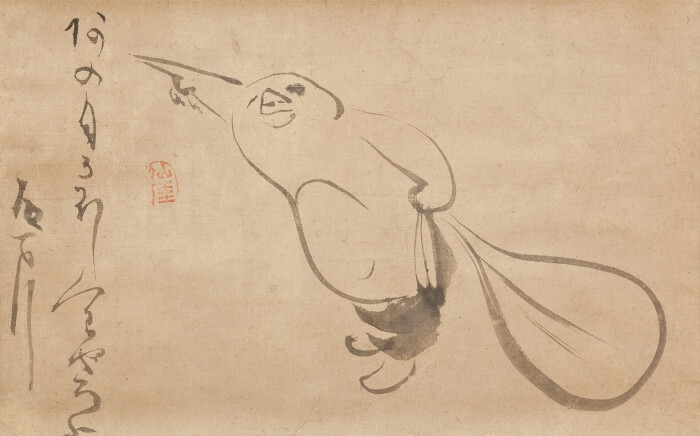 What Sengai demonstrated in his art, what continues to make his pieces so attractive, is the natural playfulness that follows from the Zen experience of awakening. In spite of the rigorous training associated with the practice, it results in a joyous and irreverent sense of being at home in the world. 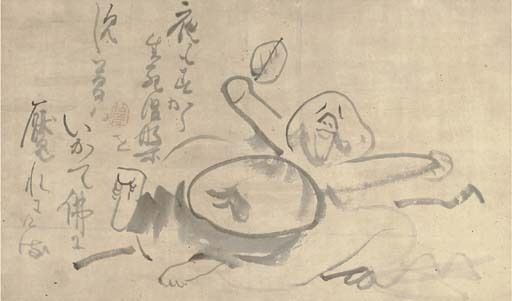 Sengai caught that feeling nicely in his painting of Tanka Tennen [Tanxia Tianran, cf. 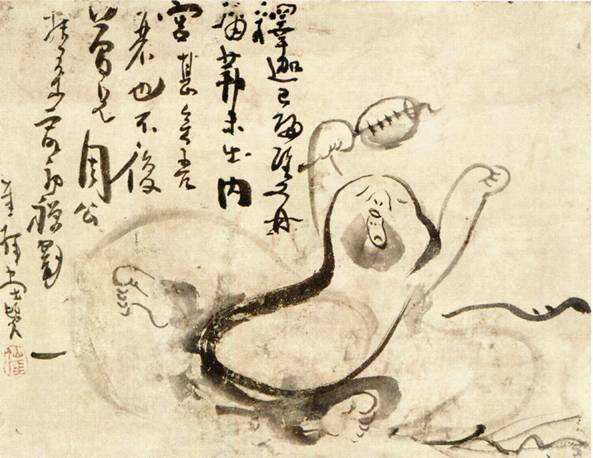 Zen Masters of China, Chapter Six] warming his buttocks on the fire he had made by burning a wooden Buddha. When Sengai was first appointed Abbot of Shofukuji, he discovered that some of the monks were in the habit of sneaking out of the monastery at night in order to spend time in bars and brothels. One monk in particular made regular forays in this manner. The platform was never replaced, and monks no longer snuck out of the monastery at night. After achieving his initial kensho, Tangen Toi asked Sengai permission to undertake the traditional pilgrimage to other temples to deepen his understanding. But each time he put in his request, Sengai wordlessly gave him a rap on the head with his abbot's stick. After being refused in this way several times, Tangen approached the head monk and asked if he would intervene on his behalf. The head monk agreed to do so and spoke to Sengai who relented and agreed to allow Tangen to begin his journey. However, when Tangen presented himself to thank his teacher, once more Sengai struck him and said nothing. The head monk went in to Sengai and asked about the matter. “But this is horrible!” the villagers complained. A certain daimyo was so proud of the chrysanthemums growing on his estate that members of his household came to feel he cared more for his flowers than he did for them. When one of his retainers inadvertently broke one of these flowers from its stalk, the daimyo flew into a rage and had the man put under restraint. The retainer, in turn, considered that he had no option but to commit seppuku. One of the retainer's family members sought out Sengai and asked if there were any way he could intervene on behalf of the imprisoned man. Sengai agreed to see what he could do. That evening the daimyo heard a commotion in the garden. Rushing out, he found the famous and respected Zen master cutting the blossoms off each of his chrysanthemum stalks. “What's the meaning of this?” the lord demanded. “Even the most beautiful weeds become rank if they aren't properly pruned,” Sengai told him. The daimyo released his retainer and no longer gave his flowers more consideration than they were due. Sengai was proud of Shokfukuji's status as a leading Zen temple in Japan, and felt that he left it in good hands when Tangen became abbot. He was happy that Tangen had the opportunity to oversee the temple's 600th Anniversary Celebrations. But, in 1836, Tangen fell afoul of the local authorities and was banished to Oshi ma Island, and, at age 86, Sengai had to come out of retirement and resume his duties at Shofukuji. He lived for two more years, attaining the beiju—his 88th year, which is considered to be the age of congratulations. He might have lived longer had he not been burdened by the administrative duties of his office. As it was, he fell ill a few weeks after his birthday celebration. ... we now turn to Sengai as a unique individual who had become awakened to primary enlightenment and who could represent that experience in visual form. Whether or not such an experience could be depicted might be argued, but this problem is not relevant to Sengai. 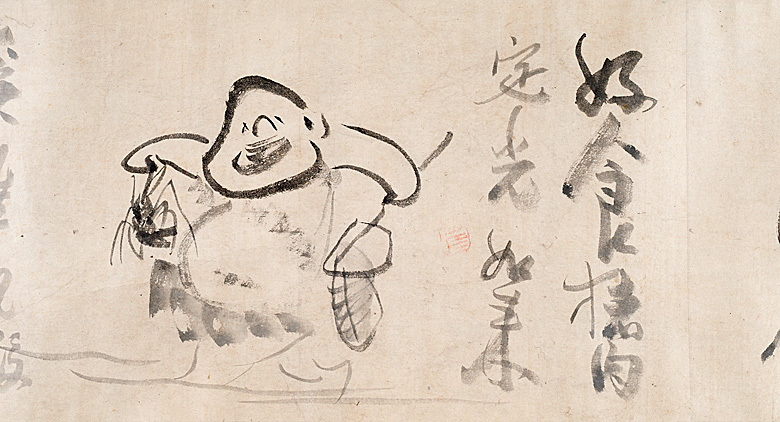 His experience of enlightenment quite naturally took a visual form, expressing itself directly in his drawings and calligraphy. To put it in another way, there is no artificiality in his work; rather it is a direct expression of the experience of enlightenment itself. 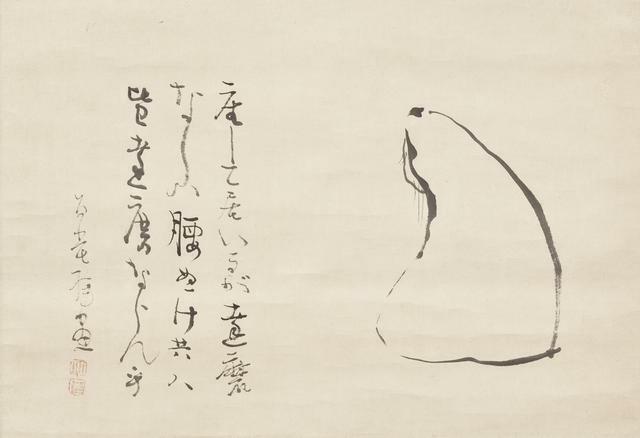 Sengai's gift for drawing and calligraphy was superior to even that of professional painters and calligraphers. Such gifted people often end up defeated by their own talent--drowned in it, so to speak. There have been many who, though recognized as geniuses, never achieved success, due to misfortune brought on by their own talent. They would not have been brought to ruin if they had not been so gifted. 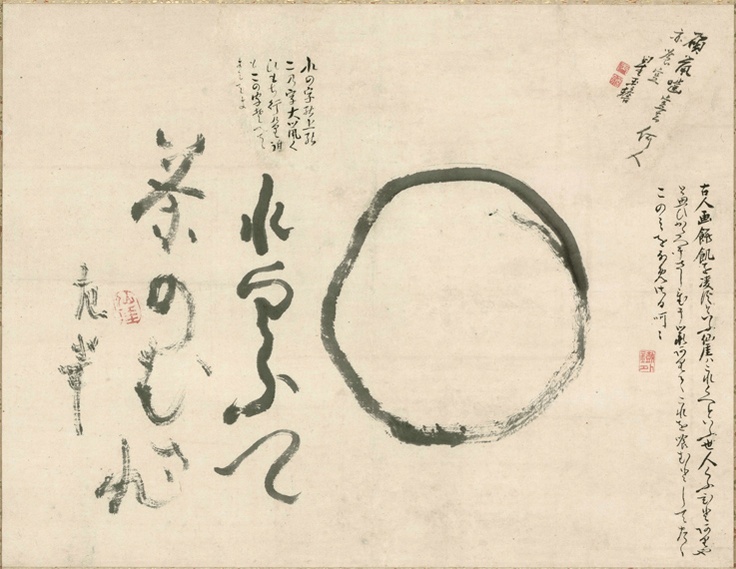 We know a number of Zen personalities who were gifted in either drawing or calligraphy, particularly those who had exceptional talent for drawing, but whose genius was often the cause of their undoing as Zen practitioners. It is only when it is unified with Zen in their art that their talent truly shines. 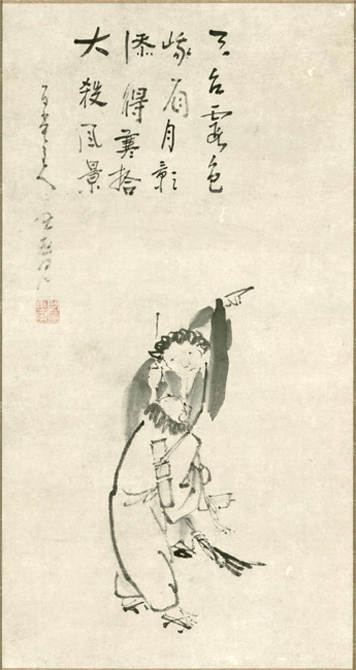 Talent alone produces a mere painter whose work totally lacks what is unique to the art of Zen practitioners. 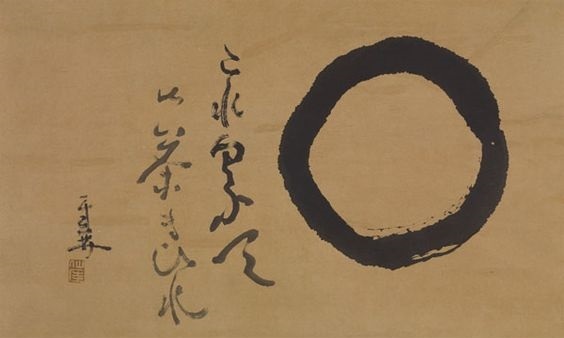 Zen painters, by definition, must have Zen in their art. The same can be said of calligraphy. 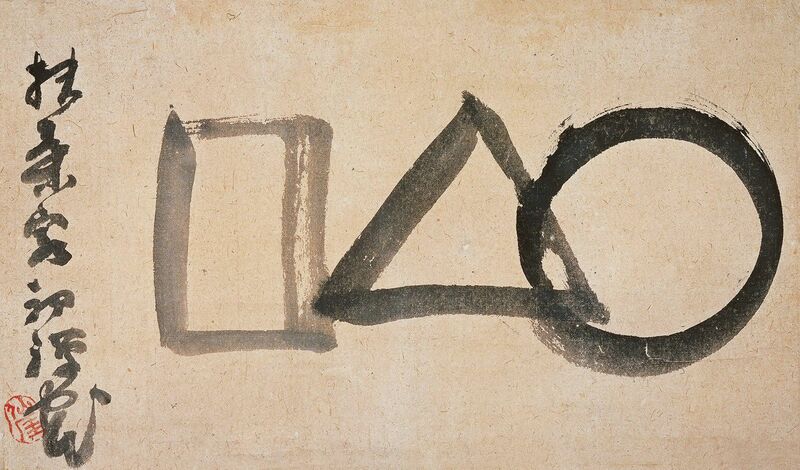 There have been several instances in which Zen practitioners failed to see this obvious point and allowed themselves to "drown" in their talent, eventually turning out to be nothing more than ordinary painters or calligraphers. 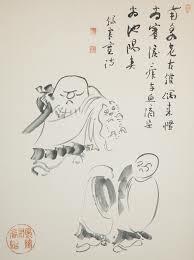 Sengai does not belong to this type: blessed with superior gifts, he depicts Zen in his drawings and calligraphy. 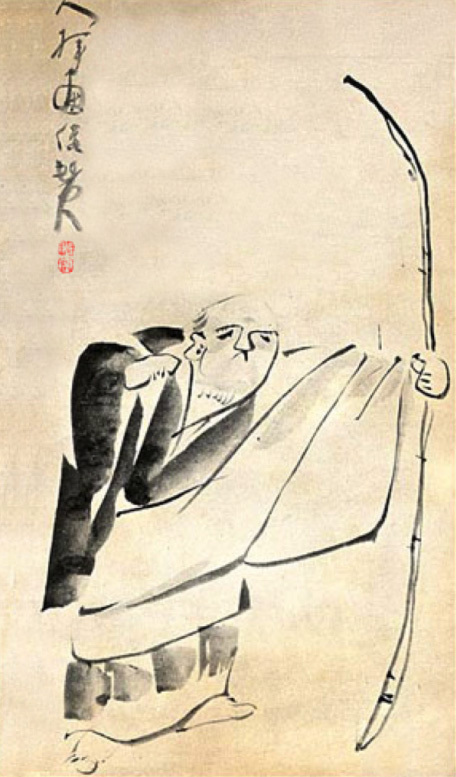 Zen, of course, is formless, figureless, and bodiless, but nevertheless Sengai manages to reveal it. His pictures, unconventional and funny, might be classified as cartoons, and yet they possess a certain distinguishing severity. Zen is there, and so is enlightenment. Moreover, it all seems to be done so effortlessly. Enlightenment is there, but it is enlightenment without pretense. 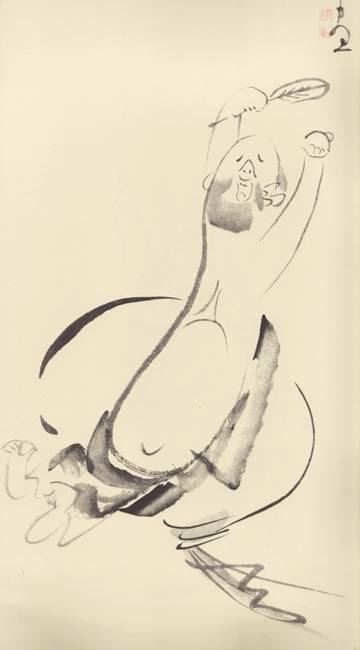 "A scholar smacking of a pedant might still be bearable," Sengai wrote, as mentioned earlier, over a drawing entitled "Great Master Bodhidharma," "while a buddha with a buddha air is not bearable." For Sengai, both sanctimonious Buddhism and self-congratulatory enlightenment were things to avoid. Anchor Books, Doubleday & Co., Inc., Garden City, New York, 1963, pp. 108-109. There was to be a big party at the house of the Chief Minister of the Kuroda Clan of Hakata, and both Kamei Shoyo, the famous Confucian scholar, and the master Sengai (1750-1837, Rinzai) were invited. The host informed Sengai that the great teacher would be present, implying that the master, who was indifferent to worldly matters, would have to come dressed for the occasion. On the appointed day Sengai entered the mansion wearing a costume of white, violet, and gold. His rosary was of amethyst and he even carried a ceremony-fan. Followed by his disciples, he crossed the room in great dignity. At this the other guests held their breath. By the gods of poverty. When the host and the guests read these lines there was great rejoicing, and all praised Sengai warmly. Meghalt 1837-ben a tizedik hónap 7. napján. 88 évesen. 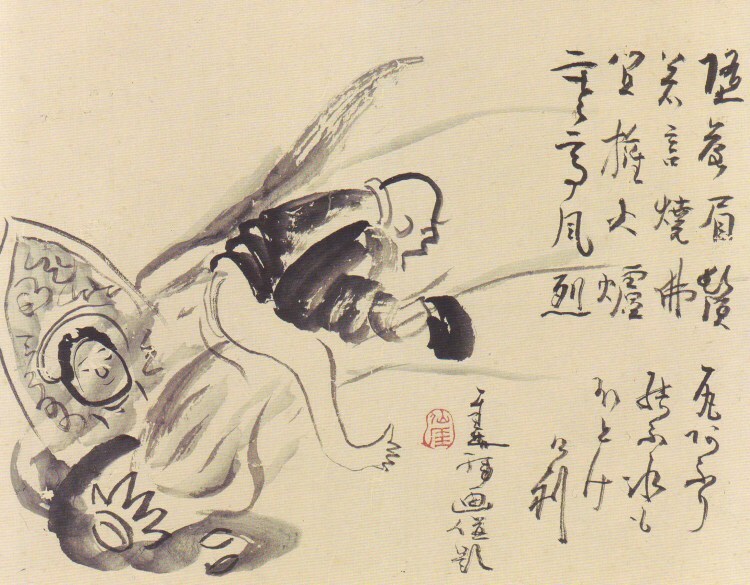 Yoel Hoffmann: Japanese Death Poems: Written by Zen Monks and Haiku Poets on the Verge of Death. Tuttle Publishing. 1986. Ő, aki megy, csak a végét. Sosem tudva, merre fújják őket a szelek.